Home > Uncategorized	> true humility? This past Sunday, I brought a message to the people of ECF that flowed directly from my devotional work last week. The focus was on “true humility.” Frankly, I wasn’t crazy about the reflective readings for the week. It felt to me that the flavor of piousness was a little too strong in the recipe for humility. Our trying to be humble usually doesn’t sit right in any situation. It’s like an adolescent female trying to manage a tight dress and high-heels in a formal setting. I saw this exact image at a wedding just a couple weekends ago. 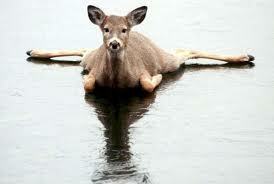 She so wanted to be graceful, but she was like a newborn fawn attempting to cross a frozen pond. The poor girl was so uncomfortable and unsure. You could actually feel her awkwardness. That’s what forced humility feels like. The cues we notice the most, the ones that carry the fragrance of real humility, are in what we feel in an encounter… not necessarily what we specifically see or hear. In fact, it may not dawn on us until much later that we’ve brushed up against that sweet essence. It’s not that easy to describe or explain. That’s probably because we encounter so little of it in our culture. It pains me to say it, but in the place where it should probably be the most prevalent, i.e. “church,” it’s almost non-existent. That shouldn’t be shocking news to anyone. I’m not trying to kick the pooch here, but there are some legitimate reasons why the spirit of humility doesn’t hover in our spiritual systems. If you’ll do the math and just think of the things that are opposite of humility, you’ll probably draw your own conclusions on why humility is so elusive and sparse. CAN YOU BE BOTHERED WITH ANOTHER PERSON’S DRAMA? IF ASKED TO HELP, WHAT IS YOUR DEFAULT: FIRST FIGURE OUT HOW TO EXCUSE YOURSELF, OR HOW TO GET INVOLVED? IS DIFFERENT AUTOMATICALLY WRONG IN YOUR ESTIMATION? HOW LONG CAN YOU STAY IN A CONVERSATION THAT IS NOT ABOUT YOU? HOW LONG DOES IT TAKE YOU TO HIJACK A TRAIN OF THOUGHT TOWARDS YOUR DIRECTION? WHEN IS THE LAST TIME YOU VOLUNTEERED FOR ANYTHING? CAN YOU ENJOY ANOTHER PERSON’S STRENGTHS WITHOUT LAMENTING YOUR LIMITATIONS? CAN YOU APPRECIATE YOUR LIMITATIONS? HAVE YOU ACCEPTED YOUR INADEQUACY AND IMPERFECTIONS, OR ARE YOU STILL TRYING TO FIND WAYS TO COVER THEM UP? WHEN EXPOUNDING ON YOUR FAITH IN PUBLIC, DO YOU FIRST POINT OUT WHAT YOU’RE AGAINST OR WHAT YOU’RE FOR? HOW MUCH “US AND THEM” VERBIAGE IS IN YOUR VERNACULAR? WHAT HAPPENS INSIDE OF YOU WHEN THOSE WHOM YOU WANT TO BE NOTICED BY DO NOT NOTICE YOU? WHO WERE THOSE PEOPLE… THE ONES THAT YOU WANTED TO NOTICE YOU? THE PEOPLE THAT JESUS WENT OUT OF HIS WAY TO BE AROUND… ARE ANY OF THOSE PEOPLE IN YOUR INNER CIRCLE? DO YOU HAVE ANY FRIENDS WHO DON’T, WON’T, OR CAN’T RECIPROCATE WITH ANYTHING… AND YOU’RE GOOD WITH THAT? HOW SAFE ARE THE WOUNDED AROUND YOU? HOW SAFE ARE THE WOUNDED WITH US? DO THEY HAVE TO GET FIXED IN ORDER TO STAY? I don’t really like all my answers to these questions. I’m sure you’re much better with your honest answers, but I need to work on some things. Serious work. Thanks Joey. Love you guys! so good. this is both a challenge and an encouragement to me. love you people deep. This is awesome. Some really good thought-provoking soul-checking questions in here. I’m surprised (in both a good way and a bad way) by some of my answers. I’m pretty sure you’re not alone in your sentiments. Love you woman! Another great blog Mike! Hanging around mom and dad this weekend has made me ponder…..Thanks! Wow Mike. Really good questions. Hard ones. Reality check. I didn’t like all my answers either. Well off to work I go:) Love you sweets. You’re awesome. UGH…I need work. Thanks Mike. All of us need work William!